I love a good backpack. They've been my go-to travel and festival bag for a number of years now. As I've been traveling more for work however, it's been difficult to find a backpack that's functional, durable, stylish and under $150. 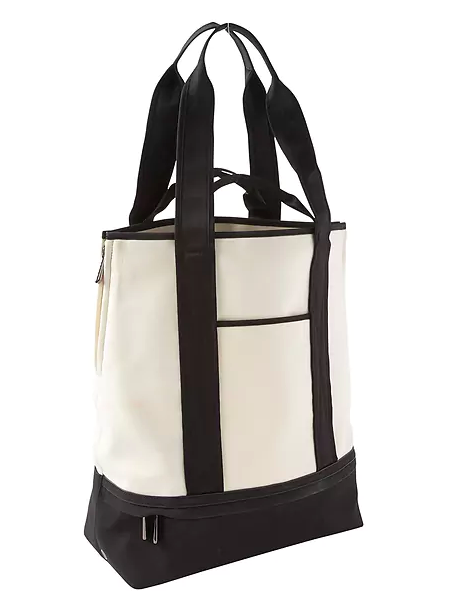 The Caraa x Athleta Convertible Backpack came across my Instagram feed one day and I knew it was the bag for me. Caraa produces beautiful bags that are built as much for performance as style. They also price out around $400. What makes their collaboration with Athleta so special is all of the products in the collection are super affordable and functional. The Convertible Backpack is made of durable neoprene which also makes it water resistant. It has interior pockets that easily fit a 15" laptop and plenty more. I filled it with my laptop, notebook, iPad, two iPhones, power cords, protein bars, and a 1 Liter water bottle. It still zipped with ease. The front pouch unzips and has its own strap so it can be worn around the waist or as a crossbody bag. This pouch was perfect for purse essentials. I unzipped it and took it to lunch without having to take the full backpack. There is also a zippered compartment that would fit a pair of sneakers easily. An extra small tote is tucked into an inside pocket. It's the perfect place to throw sweaty gym clothes without worrying about them getting anything else in your bag wet. Room for a pair of sneakers and a zip-off pouch. The zip-off pouch comes with a strap to make it a waist bag or a crossbody. What I love most about this backpack is that it's a bag I don't mind taking into a business meeting. I've been traveling with extra tote bags for over a year because I didn't want to drag my giant Swiss Army backpack on sales calls. I got a lot of compliments on this bag this week, including one as I was boarding my flight tonight. Scoop this one up as soon as you can. It also comes in white and in a tote version. Click the images above or shop the Caraa x Athleta collection here.